(Palgrave Macmillan, 2009) xvi + 275 pp. Reviewed by Nikki Hessell on 2010-01-11. As the tension between the title and the subtitle of his book suggests, Alberto Gabriele is torn between two competing projects: a study of a very broad theme emerging out of the complex and daunting terrain of Victorian publishing, and a study of a more refined theme in the periodical called Belgravia. It is probably impossible to reconcile two such different projects within a single work, and Gabriele's book, while producing some interesting insights, is not able to bridge the gap. 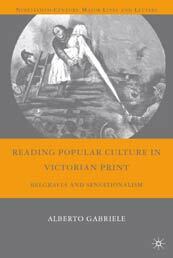 Following a short preface, an introductory chapter examines the meaning of sensationalism in the 1860s and 1870s and the methodological and theoretical approaches that underpin the book. Chapter One aims to bring these ideas to bear on the specific case of Belgravia by explaining the need for what Gabriele calls, in the chapter's sub-title, "a new intertextual reading of the periodical press." This chapter outlines the importance of reading Belgravia in terms of the reputation and concerns of its editor from 1866 to 1876: Mary Elizabeth Braddon, who was also the author of sensational novels. Chapters Two, Three and Four focus on the themes of fragmentation, anonymity, and advertising and commerce respectively, before a somewhat digressive (although interesting) chapter on sensationalism and the early history of film. The final chapter moves to the 1870s and 80s and examines Braddon's connections to sensational literature in France, before the book concludes with a comprehensive index of the contents of Belgravia during her stewardship. While these angles all have merit, the book falls into the trap of trying to make an ostensibly narrow and focused topic speak to much wider cultural concerns. The reader actually comes away with very little information about the periodical Belgravia or its links with sensationalism. This is a shame, because studies of the sort that this book purports in part to be-close and careful readings of every issue of a single periodical title during an interesting period in its history-are extremely valuable to scholars in a range of different fields, many of whom are not going to read issue after issue themselves but are grateful that a colleague has approached the task so thoroughly. The appendix suggests that Gabriele has indeed been thorough in his research, but not enough of that effort is reflected in the finished product. Chapter Two is an important exception, and includes the best section of the book, a section in which the actual content of Belgravia is scrutinised for its commentary on sensationalism, particularly in the article "On the 'Sensational' in Literature and Art" contributed by George Augustus Sala in 1868, and in a very interesting discussion of the scientific content of the magazine. But in the chapter on anonymity, for example, there are no examples from Belgravia, while the chapter on advertising, although it does include examples from the periodical, does not do enough to make the case that Belgravia's advertisements were significantly different from those in any other contemporary magazine. The chapter on early film-making similarly leaves the link to Braddon and Belgravia tenuous and frustratingly under-explored, although Gabriele has some very interesting things to say about the way in which periodicals and the new technology of the magic lantern shows fed off each other. For instance, this chapter includes a marvellous pair of images, one of which is reproduced on the cover of the book, of the illustration which accompanied the serialisation of Braddon's Fenton's Quest and the virtually identical scene from a magic lantern slide. The images depict the rescue of a woman from a burning building; her face is covered and it is unclear whether she is alive or dead. The original photographic slide appears to have inspired Louis Huard's illustration for the serial version of Braddon's novel in 1871, and Gabriele rightly points out that such overlaps demonstrate how "popular industry capitalized on scenes and narratives of realist inspiration" (120). More of these specific examples would have been extremely welcome. The sixth and final chapter, however, once more swerves away from Braddon. Though it treats her success and influence in France, it does not do so in the context of her magazine, and it lengthily examines popular French novels without any explanation of how they connect to either the novelist or Belgravia. The lack of evidence about Belgravia's content means that the reader is never convinced about the most plausible of Gabriele's arguments, and there are unfortunately also too many instances of unjustifiable claims about both the theoretical and methodological framework for the study. In this respect, the preface sets the tone for the book as a whole by asking far too much of the material. Sensible and interesting evaluations of Victorian periodicals are followed by rather grandiose claims about what we might learn from them. Gabriele suggests, for example, that novels from the period often end with the reassertion of traditional values, whatever sensational material the story might have included. "In the periodical press, however, it is the rest of the magazine to which the shaken and aroused reader is redirected and manipulated into accepting the structures of order that the fiction challenges. Can Victorian sensationalism, therefore, provide a model for the many meanings and uses of sensationalized and violent shocks in pre- and post- World War II systems of government, from the violence of fascist Italy in the late teens, or the many countries that adopted it, to the 'shock economics' discussed by Naomi Klein in our contemporary context?" (xix). The first sentence of this quotation strikes the reader as valid, or at least worth considering; the second sentence produces incredulity. Similar questions have to be asked about the author's claims to be using a "new" method for researching periodicals by approaching them intertextually; not only is intertextuality a well-established method in Victorian periodical studies, as exemplified in the work of eminent scholars such as Laurel Brake, but Gabriele's research does not deliver on the promise of intertextuality because we are told so little about the magazine's content or that of its competitors. These are promising ideas, but unfortunately, the book becomes less and less a project about linking Braddon's credentials as a sensational author with the periodical debates about sensationalism, or establishing what it was about Belgravia that marked it out as the epicentre of these debates. The chapter on anonymity, for example, treats Braddon only in the context of one letter, written after her editorship had ended, requesting that some of her writing be published anonymously. Quite what this has to do with sensationalism-or indeed Belgravia- is unclear; the chapter seems to exist as an excuse to highlight this letter, which was previously unpublished. Likewise, the chapter on advertising shows with some worthwhile examples how apparently sensational language served to market products to Victorian consumers, but Gabriele never fully explains how Belgravia's use of advertisements differed from that of other publications or contributed explicitly to the periodical's overall presentation of sensationalism; once more, then, Gabriele leaves his central point unclear. The same could be said of sensationalism in the book as whole. Even in the introduction, which is titled "The Cultural Trope of Sensationalism"; Gabriele fails to explain just exactly what he means by this key term and how he plans to use it. Without a clear definition of what counts as sensational, and why, the book tends to attach sensationalism automatically to events such as war and trends in popular culture without much consideration of whether the specific instance could actually be considered sensational. Moreover, Gabriele fails to recognize that awareness of links between sensationalism in the press and sensationalism in popular culture did not begin in the later decades of the nineteenth century and does not mark the period out as unique; from the very beginnings of newspapers and magazines, over a century earlier, these links had been debated and exploited.
" (4). Which articles, book chapters, and historical excavations, the reader asks? These are usually listed in an accompanying footnote, which answers the basic bibliographical question but does not elucidate exactly what is specifically new or different about Gabriele's work, nor provide an adequate acknowledgement of what has come before. In numerous ways, the author has not been well-served by his publisher. There are many distracting typos and several peculiarities of expression that should have been dealt with by an editor, especially the tendency to refer to Braddon by her full name, quite unnecessarily, and the peculiar and anachronistic use of the word "Chunnel" in place of "Channel" in relation to the connections between English and French literature. Most significantly, an editor should have insisted on both a clearer explanation of the book's intentions and a more rigorous attempt to realise those intentions. These weaknesses are disappointing, not least because the book has several excellent features, particularly when it sticks close to Belgravia itself. Gabriele's familiarity with continental European sources is extremely valuable, and opens up new lines of inquiry for scholarship on British periodicals. The appendix, with its index of the magazine for the years of Braddon's editorship, will be enormously helpful to other researchers, and demonstrates the thoroughness of the author's research. So too does the information about the global distribution networks of the magazine, although the relevance of this aspect of the study to the theme of sensationalism is unclear. These strong sections point to the valuable study of this fascinating period in Belgravia's history that might have emerged in this book if it had not tried to make so many untenable connections, if there were more Belgravia and less Benjamin. Nikki Hessell is Senior Lecturer in Journalism Studies, Massey University. I read with great interest Dr. Hessell's review. Some of her comments are very interesting and I accept them with gratitude. Overall, however, the review seems to avoid the very specific claims that the book makes. The review makes no mention of the phrase "montage effect," which recurs many times in the book, nor engage, even peripherally, with the vast scholarly literature on nineteenth-century visual culture. To name just a few of the influential scholars cited in the book, it explicitly acknowledges the work of Jonathan Crary and the contributors to Cinema and the Invention of Modern Life (1995), edited by Vanessa Schwartz and Leo Charney. The book also presents archival evidence that links reading practices with pre-cinematic --and early cinematic-- forms of entertainment, which Dr Hessell's review never ties to the larger implications that the book makes. In no section does the review recognize what the introduction makes explicitly clear: that print culture --Belgravia being only a case in point-- transformed the idea of the author, the text, and the reader. Missing this introductory point inevitably leads to misunderstanding or missing many of the other points that are made in the course of the book. Along with its preface and its introduction, the six chapters of the book examine the transformations that authorship, reading and textuality underwent in the course of the long nineteenth-century. Saying that the book does not address some of these issues, like reading practices or a new form of intertextuality, is paradoxical. Though Dr Hessell critiques the book for not defining the trope of sensationalism, the trope is defined more than once--which some other reviewer may say is too often. In the index of the book itself the term "sensationalism" has many sub-entries. Dr. Hessell asks questions of the book that might have been answered by the index itself, for instance through the reading tips it offers for those who wish to follow them carefully, even independently of the narrative the book offers. The preface also proposes --only proposes-- to reconsider the practice of literary studies that the discipline of philology has shaped over the past two hundred years. This hypothesis, which is offered in the hope of starting a debate, proposes to reconsider certain accepted notions like the traceable transmission of a certain idea across very identifiable authors, texts or disciplines. The impression Dr Hessell describes--that the book develops a very broad idea of textuality and culture-- is precisely what the system of internal references that animate the book wants to convey. Dr Hessell's review seems to go through the book somewhat hastily, maybe impatiently, particularly when a certain idea of scholarly research is not the only structuring force of the book. Though Chapter 2 met with Dr Hessell's approval, she overlooked the fact that each chapter (including chapter 2) treats a field of cultural production, and thus responds to the same historical and intellectual challenges that are discussed in the other chapters. The serendipitous discovery that I made of the magic lantern slide in Padua, which matches the illustration of Braddon's novel published in Belgravia, points, as the chapter explicitly says, to a form of narrative based on almost mechanical repetitions of certain narrative functions, a term that I take from Vladimir Propp, while elaborating on the specific cultural context of the 1860s, both in chapter 5 and in chapter 2. Chapter 5 strikes Dr Hessell as "somewhat digressive." Though she laments that that I have given too little attention to the contents of Belgravia, she wholly ignores my claims about its contents, such as its use of urban space as a branding strategy, the discourse of abstraction, and sensationalism at large. Even when mentioning the section on advertisements in chapter 6, she does not explain as succinctly as she might have what the book says about advertising in relation to the gendered discourses of the medical disciplines and the pharmaceutical industry. Not does she link the section on advertisements with the other sections of chapter 6, which are explicitly summarized in its opening paragraphs. Take the history of journalism and the debate about anonymity in chapter 3. Dr Hessell rightly states that the opening part is meant to place the unpublished letter by Braddon in a broader context. But to say, as Dr. Hessell does, that the letter does not pertain to Belgravia and sensationalism seems to miss the point that Braddon's letter concerned her views on Zola as a "sensational" author: views she expressed in an article that she wanted to publish anonymously. In conclusion, consider how the book reflects the influence of Benjamin, Adorno, and Foucault. I quote each for specific reasons, inasmuch as their work may be adapted (or not) to the specific context of popular culture in the 1860s-80. Dr Hessell seems to lump them together by calling them "dated" and "no substitute for the scholarship of those who work specifically on the history of reading, Victorian periodicals or Belgravia itself." Since when have Benjamin, Adorno and Foucault become dated? Their influence appears, more or less directly, in many important fields such as gender studies, cultural studies, literary studies, philosophy, cultural history. I have seen their works assigned in courses taught across the disciplines, from cinema studies seminars to seminars on historiography or on translation theory and media studies (maybe less so? I cannot provide statistical evidence). No work that requires us to think through established categories is ever dated. Leave a comment on Nikki Hessell's review.